My column has returned to the Escapist. One of the great things about reaching a new audience is I can whine about stuff that still bothers me but that my regular readers are totally sick of hearing about. With that in mind, this week I’m whining about the circus of random inputs and baffling design decisions that is the No Man’s Sky interface. Here on the blog, I usually post my “This Dumb Industry” columns on Tuesday. I think I’m going to move TDI to another day of the week so we don’t wind up with both articles going live at the same time. I’m not sure what to suggest about leaving comments. In the old days, I encouraged people to leave Experienced Points comments on the Escapist. But things are a little janky right now. The comment counters don’t work, so every article claims to have “0 comments”, even though you can click through and see the comments work just fine. I know the team is still working hard on the site and I’m sure details like this will be ironed out soon. In the meantime, feel free to leave comments either here or there. Here is a direct link to the Escapist comments for the column. Also, I really need to get around to updating the splash image one of these days. I think that picture is about 8 years old. Obviously I’m way more handsome these days because that’s how aging works. Both No Man’s Sky and Minecraft are trying to accomplish similar things. They’re both designed to allow the player to arrange a large number of items in a finite grid of inventory slots and move items between different sorts of containers. Minecraft does this but showing both your inventory and the target container at the same time. You can click-and-drag items, split stacks, send stacks, or pick up single itemsActually, I can’t remember how many of these features belong to the core game and how many are from mods.. When you’re looking in a container, you don’t get to see your inventory and the container side-by-side. Instead, you can only see the container and have to remember the state of your various storage locations. If I need to take 1,000 units of iron out of my vault, I have to know without looking if I’ve got room for it in my pockets or my spaceship. What you end up with are all of these pages of inventory that smother the viewport in grids and yet don’t provide you with the information you need. Paradoxically you wind up with something that is both overly complex and yet lacking in features. You’re subjected to a deluge of information and yet you can’t see the information you’re interested in. The system runs on complex rulesDifferent types of storage have different stack sizes, different ways of upgrading them, and different default behaviors. that don’t lead to interesting gameplay. The whole thing is almost beautiful in its awfulness. Tragically, there’s no way to fix any of this. Addressing the inventory problems would require a massive redesign that would involve throwing out a lot of ill-conceived systems. I can’t imagine doing something like that in the context of an update / patch. The problems cut to the heart of this misbegotten design that’s focused on using bulky resources to fill bars. Actually, I can’t remember how many of these features belong to the core game and how many are from mods. Different types of storage have different stack sizes, different ways of upgrading them, and different default behaviors. That’s a rather abrupt end to the article. I’m… secretly in love with all the bad games I trash and I only treat them so badly to lessen my guilt ? Don’t leave us in suspense, man! Oops. That was supposed to be something to the effect of “I’m thinking it’s time for a new header image” but then I realized that should go at the top of the article and not the end. On a Highway to Hell? This may not be the place for this, but oh well: Can the formatting guide be hidden in some kind of “spoiler”? AKA, not shown until you click a button to show it? I agree. The comment cheat-sheet takes up a lot of screen real-estate, especially with the new theme, and makes it difficult to see the comment one is ostensibly replying to. On the other hand, it’s mostly for new commentators, who might not know to even look for it, so the current size and location fits that need really well. If there’s cookie data to autofill, hide it. If there is not, then show it. At least, that’s my relatively-novice suggestion. I’m going to regret asking this, but… there’s a difference between “markdown” and “Markdown”? The capitalization was a bit of a joke on my part, but there’s definitely different flavours of markdown. Wikipedia hasthe oldest one I know of, then there’s the GitHub / Stack Overflow version, which I think has become a de-facto standard (it’s supported by PyCharm, plus plugins for other IDEs), and I think I saw a third variant somewhere. Plus, any website that doesn’t implement the full feature-set, if you count that. Reading the article is like going over all the comments I’ve been making on various forums for the past month since the NEXT update came out. No Man’s Sky is a game of failed confidence. The creators appear to have had a crisis of faith midway through development when they decided the procedural-explorational core of the game wasn’t as compelling as they’d hoped. Their solution was to implement a “progression” system, in which progression is measured by the ratio of time you spend actually playing the game vs in an inventory screen. The incoherent UI is just icing on that particular poop cake. Welcome back to the escapist.Though I wouldve preferred if came back with a comic,or a lets play while keeping your articles here,more content is more content,so Im good. As for old timey bad interface in a modern game,I have been playing phantom doctrine.Its not as atrocious as what you are describing here,but it has its….quirks.For example,if you want to sell/buy something,you dont have a shared “items” place where you can do this,you have to go to the inventory of your people.So you go to the dormitory,select one of the agents,select a weapon slot(or an item slot,if you want to sell items),then click the buy/sell card and do the transaction from there.Of course,you cant sell something thats used by a different agent in this fashion,youd have to select that agent first.Oh,and this does not work for weapon mods,which you can see only if you click the buy/sell card once you select a weapon mod slot.Which you can only get if the person you selected is equipped with a weapon they are proficient with.And of course,you cant access your support items this way,you have to go to the starting menu for a mission(that you have scouted first,because support is not available otherwise),select a support slot and plop an agent there,then go to the store tab,and only then can you sell and buy stuff. Its a real shame,because phantom doctrine is a game in a genre I like and I really wish the game wasnt this janky.So I feel the same pain you feel with no mans sky. I can’t comment on that game, but regarding NMS, another UI atrocity: you cannot sell stacks from the inventory at the trade terminals. Instead, you have to input a raw number (by means of arrow buttons to increase or decrease the amount – no typing- then hold left mouse to perform the transaction) and then it takes that from… somewhere in your inventory. It distinguishes between your personal and ship inventory, but for example not between the normal and the cargo inventory. If you just got two stacks of carbon to sell quickly because you need the room to collect more copper, it’s often not even worth that UI hassle, and I end up just deleting the two stacks instead. Also, the list of items seems to follow some kind of order, like some items tend to appear in near the top, some tend to appear near the bottom, both of which still mean scrolling through a few pages to find them, and by scrolling I mean pressing the arrow buttons or W/S to flip through pages that could easily fit 10x as many items if they had a proper compact tile-based layout instead of a blown-up list that fits no more than 10 items on the entire screen. I’m rabidly playing Monster Hunter World since it came out on PC and that one has a mess of an UI as well. In some instances the styles and controls differ so much it looks as though different people developed it independently. 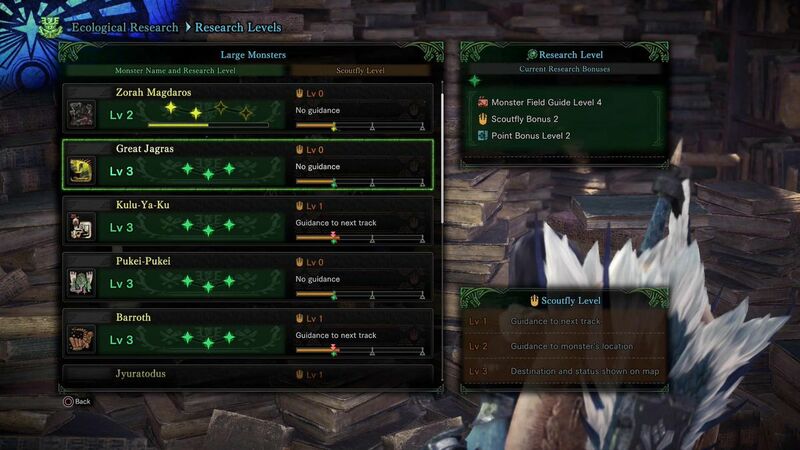 Take for instance, the research level screen and the field guide. Both of them are accessed at the same NPC (although, yes, I know the field guide is accessible at all times from the start menu), but are presented in completely different styles, one of them scrolls by item, the other scrolls by page, but most importantly, the research level screen is almost redundant and could have been included in the field guide, which already has the research level as well and only lacks the Scoutfly stuff. Also why do I still have to skip three lines of repetitive NPC dialog every time I want to access the facility they represent? 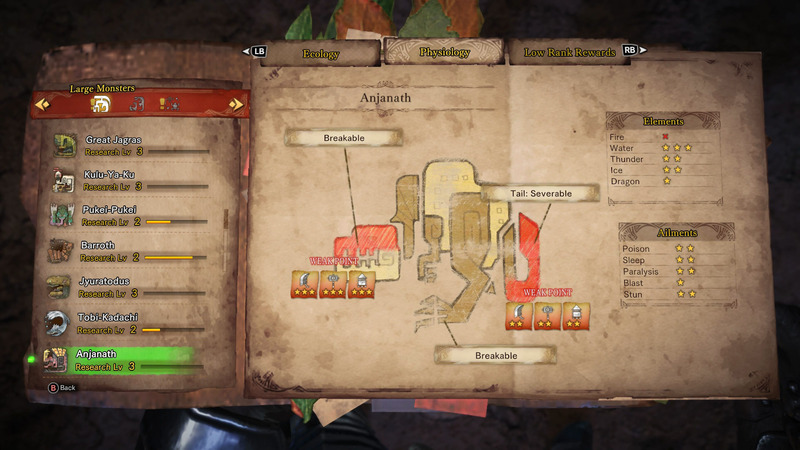 Why, after collecting the Tailraiders loot am I booted out the menu completely and have to talk to the NPC again to send them on another safari? Why am I always teleported back to the tradeyard even after I left for a hunt from the multiplayer hub? And so on. I feel like the philosophy underlying the inventory problem you identified could be summed up as something like “Playing catch blindfolded”, which seems to extend to a lot of other facets of NMS as well. Imagining how I would design a Minecraft-style inventory system is a guilty please of mine. I can spend hours on it if I’m not careful. You and a great many others, myself included. Look at all the variations to the concept there are. First game I ever played with good item stack controls, which is very similar to Minecraft (down to the shift and ctrl click functionality) was EverQuest. However that shift and ctrl click functionality wasn’t an arbitrary choice. It’s commonly accepted keys for the functionality of “many” and “one”. Just like Ctrl-Z, Ctrl-X, Ctrl-C, Ctrl-V and so on. Commonly accepted functionality that is very similar in what it represents actually doing. That’s really where good GUI design comes from. Not dumb hype idea. Good old fashion commonly accepted controls that most of your users are already familiar with. Notice how games like Minecraft don’t even need an inventory tutorial, most people just figure it out or facepalm because they should’ve guessed that. I’m pretty sure the generally correct answer is ‘by copying whatever Minecraft does’. Yep. Conventions become conventions for a reason. There’s no point re-inventing the wheel every time. No Man’s Sky’s UI (as described by Shamus) sounds like Hello Games went out of their way* to make new wheels, that were square and lacked axles. *this is the thing that really baffles me. Surely just aping the convention of the genre is the easier choice? They were aping existing conventions, but they elected to copy from Destiny and Out There instead of a wildly successful game from the same genre. I seem to recall Sean Murray used to get annoyed about people assuming they were making ‘Another Space Minecraft’, so maybe that played into the decision. To me,it seems like no mans sky was made on the go by not so skilled programmers.So when someone discovered a better way to do an interface,they would apply that only to their current task,while ignoring things they did before.Hence the mishmash of ui elements that act in such a disparate fashion. Well if I was going to blindly copy someone I’d pick the Prey reboot, but yeah. Yikes, it’s worse than I thought! Particularly the way mouse clicking sometimes does the opposite of what you’d expect. ….and if the dev’s can’t/won’t fix the interface & inventory issues, then it’s probably not something modders can do either. Welp, that might push my purchase of this game from the ‘when on sale’ category to the ‘never’ one. My favorite NMS UI element is the seamless transition between Right-Click To Exit and Right-Click To Grenade. This is responsible for 100% of my deaths. Solution: never pick up any grenades. Wait, what? Who thought exiting a menu with the button used to throw grenades was a good idea?? I don’t think any one person did this, it looks like what you get when a bunch of coders are all making their own bit of the game and they each have direct access to all the inputs with no UI designer or abstraction layer acting as a buffer zone between them. Could just be a singular person doing it as well. Remember a lot of these guys learned on forums where it was encouraged to do things like toss around the game pad, keyboard and mouse state. I used to participate in such forums and always found it stupid how many insist it’s needless complication for things like an abstraction layer over user input. Such people seem to think the only purpose of the abstraction is to let the user remap their keys. > You’re subjected to a deluge of information and yet you can’t see the information you’re interested in. NMS’s interface is really good at overloading your screen with data, without actually offering any information. It’s the menu equivalent of the current craze of spewing damage numbers at the player at a pace that’s so ridiculous half the screen is just yellow digits. We might be missing a “like” here. that my regular readers are totally sick of hearing about. Oh crap. I always thought to myself, hey, Shamus putting some of his stuff on the Escapist again soon, I don’t mind, he will post a link here anyway. And I totally forgot about the comments being split between both sites. So you either have to check out both, or potentially miss an interesting comment (possibly even by Shamus himself). Oh well. On the discovery screen you can use the W/S keys to scroll up and down the list of visited planets, but don’t try using them to scroll through the right-hand list of discovered animals. There are scrollbar buttons for that, which you can click with the mouse, that operate like a vertical scrollbar but are placed horizontally beside each other because confusion is fun. W and S work as expected on the milestones and log screens, but then they don’t do anything on the options menu, which is suddenly mouse-only. You can upload all discovered objects of a type (planets, animals, plants, points of interest) by holding E on the corresponding “upload all” button at the bottom of the list. If you dare to only upload a single item by holding E on that item, the item is uploaded and… hidden. Or rather “hidden”. It will still be shown in the list, so it is not clear whether this is meant to remove an uploaded item from the list because you are not interested in it any further – which would make for great confusion, however – “did I already upload and hide a planet, or have I missed one, the system says there are 5 but I see only 4!”. So to avoid this issue of hiding stuff becoming indeed confusing, the “upload and hide” function just makes the object no longer selectable in that list. Permanently and and irrevocably, unless you use the inofficial savegame editor and find the “hidden” flag in the raw JSON. If this sounds like I am speaking from experience, I am! You can upload an individual item, of course, also with the “upload and rename” function, and could then retype its original name if you do not actually wish to rename it… or you stop bothering and always only hit the “upload all” button forever. If you select a quest in the quest log, the game randomly decides whether to actually select it. There’s a high probability of it either reverting the previously selected quest when you close the log, or switch to one of the neighbouring quests. It seems to prefer the one directly above the selected one, but don’t you think you could conveniently select the quest below the one you actually want to selected in order to selected the correct one, because then the game might just pick a random one instead. Hey Sean, I just want to thank you for being the only apparent voice of sanity in a games media that either tears into this game like they’re casting out the Gadarene swine, or paranoically avoids any and all criticism in solidarity with Hello Games against the baying mob. I’ve thought since launch day that NMS was made by and for people who don’t play videogames, and that most of its problems come from outsider artists trying to reinvent layers upon layers of wheels, and I was starting to think I might be going mad. I’m too lazy to do any actual support and too stingy to donate to Patreon; do clicks through to your Escapist column make you look better to them? Does disabling adblocker for those clicks make you look more better to them?